We have now produced a number of new leaflets and are currently in the process of updating and producing more. Introducing porphyria and the BPA contains a general explanation of all of the porphyrias. This is suitable to give to doctors and hospital staff or friends/family wanting to know more about the condition. We have condition specific leaflets on AIP, EPP and VP, with one on HCP currently in production. 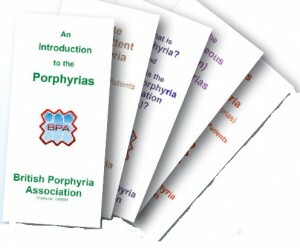 We have a leaflet on the use of drugs with the acute porphyrias. This is supported by a copy of the latest UKPMIS SAFE drugs list. We have also updated our leaflet on testing and inheritance in the porphyrias. Recently, we have completed a new leaflet on claiming benefits and concessions – there is one version for those with EPP and a slightly different version for those with acute porphyria. Keep a look out for more appearing here!